Request to book one of these rooms by clicking here. Located on the lower floor of the hotel, our Cedar Ballroom features 9ft ceilings, column-free visibility and a full customizable bar. The Cedar Ballroom can accommodate up to 175 people depending on the configuration of the room. This Ballroom features state-of-the-art audio-visual equipment, complete conference sound and lighting and staging capabilities. 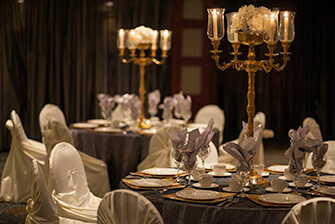 The Cedar Ballroom can be used as a venue for weddings, banquet dinners, special occasions, small conferences, product launches and cocktail parties. Request to book this room by clicking here. Located on the lower floor of the hotel, our Oak Ballroom features 9ft ceilings, column-free visibility and a full customizable bar. 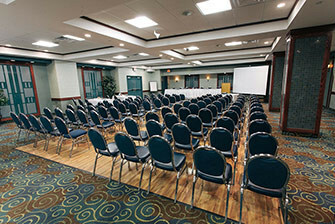 The Oak Ballroom can accommodate up to 140 people depending on the configuration of the room. Like our Cedar Ballroom, the Oak room features state-of-the-art audio-visual equipment and complete conference sound and lighting. The Oak Ballroom features a full wet bar and direct access to the lower level kitchen. This Ballroom is perfect for weddings, banquet dinners, special occasions, small conferences, product launches and cocktail parties. 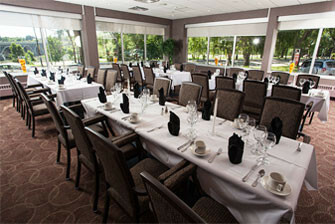 Located on the main floor of the hotel, the South Dining Room has a spectacular view of the South Saskatchewan River. The South Dining Room can accommodate up to 50 people for a basic seated dinner service and between 40 to 50 people for events that require specific seating. 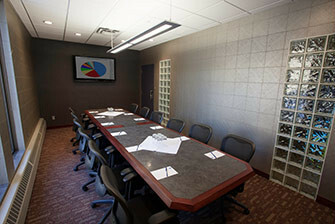 This room features a microphone, podium and screen; additional audio equipment is also available. The South Dining Room is perfect for small and intimate weddings, cocktail parties,smaller banquet dinners, special occasions and meetings. The South Dining Room has been newly redesigned and renovated. We invite you to book an appointment with us to come see this room for yourself. Please Note: The South Dining Room is not available for private functions or meetings on Sundays from 7am to 4pm.